I’m a wife, mom, and a child advocate. 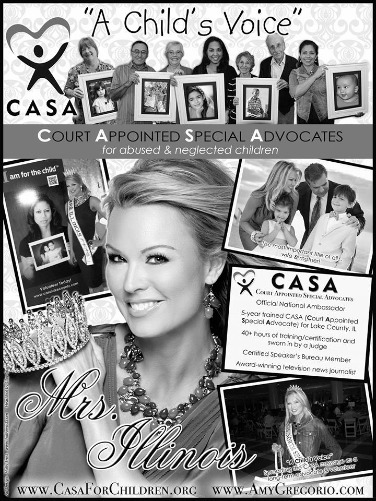 As a national ambassador for CASA and as Mrs. International 2013, I am spending the year promoting the work of CASA volunteers along with the needs of abused and neglected children struggling in an overwhelmed child welfare system. I spent my life moving around the country every 4-5 years with my family because of my father’s job in corporate America. Those moves, although lonely at times, helped me become adaptive, outgoing and confident. I learned how to stand up for what I believed in and to be myself. Years later, I became an award winning television reporter working in Chicago. There is no way I would have been able to take on the job of a journalist in the top 3 market without being confident and or willing to be a voice for others. And that all lead me to becoming a Court Appointed Special Advocate or CASA for abused and neglected children. It’s been fascinating journey. Hopefully I help others be their best by helping them feel important. I have been so fortunate in that I have met so many different people from all around the world. I am sure that although we may each come from various backgrounds and experiences…we all want to feel like we are valuable. And I believe each of us is important. I may not report the news these days, but I do feel we each have a story to tell. Hopefully my interest in each person’s story makes them feel valuable. I really try to be as positive as possible. That’s extremely important as my thoughts really effect how I approach the day. Some days are more challenging than others. And I have found, since having a family, it helps to keep myself a priority. I may not be the top priority, nor would I care to be, but I am a priority in my life. Sounds odd, but it’s critical to find even a sliver of time in your day or week to do something you enjoy purely for the sake of it. It could be reading a book; mediating; getting a breath of fresh air through walking; or catching up with an old friend who makes you laugh. As a wife and mom to two young children, I understand how easy it is to put everyone else first with little time left for yourself. It’s hard, but important to remind yourself to take a break. I’m also at my best when taking on a challenge or learning something new. That is why I decided to compete in Mrs. International. 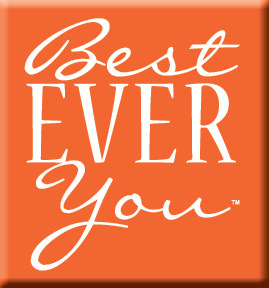 It challenges you to be at your personal best mentally, physically and spiritually. Through the journey, I have learned so much about myself and met truly inspiring women. And because Mrs. International is platform based, I am able to do more in terms of promoting the needs CASA. My wonderful husband, John, and I have been married for almost ten years! Our son, Johnny, is a second grader who can build something out of anything. Our daughter, Ali, is a kindergartner who wakes up each morning singing or dancing. I was fired once. I got my walking papers from a frozen yogurt shop in the mall. After losing a retainer for my teeth a few times, my parents had me get a job to better understand the meaning of a dollar and the cost of a new retainer. Shortly thereafter, I made the high school cheerleading squad and the crazy schedule meant I was quickly fired. It was fun while it lasted. My family, friends, children and animals are true passions of mine. That pretty much covers most of it. Not all of it, but most of it. Are we talking about one of those insanely large Powerball jackpots that covers several states? Let’s see. There would have to be a celebration of some sort with all the people I love, preferably involving flip flops, sand and steel drum music. My husband and I are blessed to have our children’s education secured. Still, I would invest a bit of the jackpot for a rainy day as those days can happen. I’d love to help several special people out with anonymous financial gifts as they wouldn’t accept help otherwise. And I would definitely give a bunch of the winnings to CASA who desperately needs the financial support given recent budget cuts. 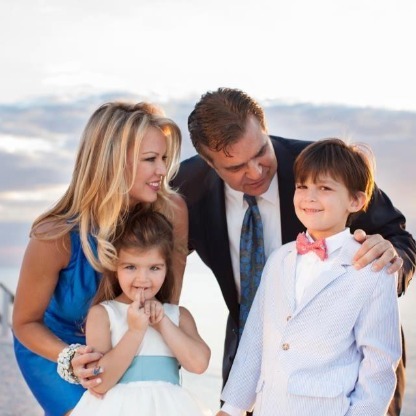 Family-wise: I want my husband and I to raise children who are people of substance. I hope they love what to they do and do with what they love for a higher purpose. I also want to survive their teenage years which I understand can be…um, challenging? CASA-wise: The goal is to have a volunteer for every abused or neglected child in need of an advocate by 2020. I would love for that to be accomplished. In a dream world, I would love to eradicate abuse and neglect all together. Finding solid solutions for substance abuse and poverty is part of those goals. I rode horses as a child and never stopped missing it. For me, there is such a special bond with horses. So, a few years ago, I decided to see if I still loved it as much as I remembered. And I did! Riding has become my yoga and a way to get centered by doing something I love. I have a new horse named Quite Charming or Quincy who is rather tall (17.1 hands) and has quite a curious personality. I recently finished, I am Malala: The Girl Who Stood Up for Education and Was Shot by the Taliban. Malala Yousafzai’s courage resonates with even after the book is finished. Every child, male or female, deserves an education.